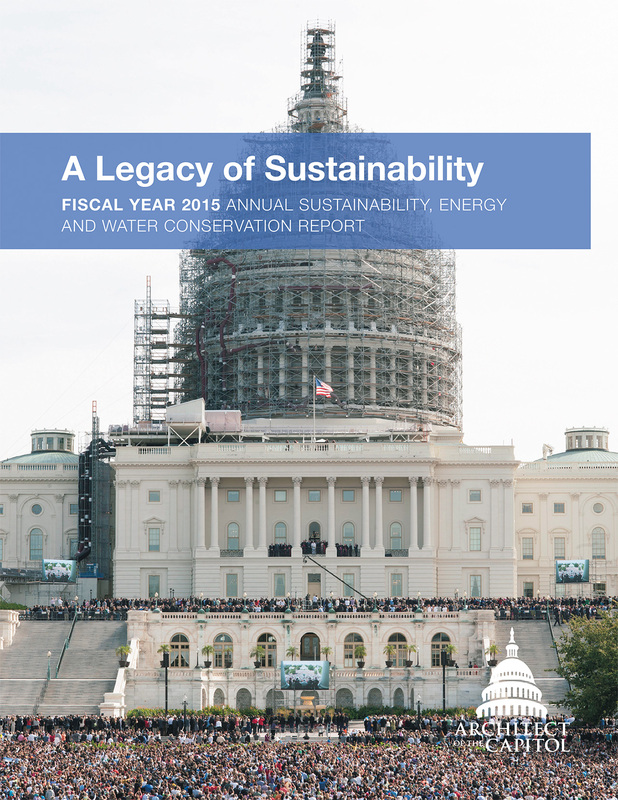 The report below was created to inform Congress and the American people of the Architect of the Capitol’s (AOC's) progress on meeting its efficiency goals as well as its further commitments to sustainability and water efficiency. It includes details on the AOC's approach, achievements and areas identified for future progress. ​Read the full 2015 Annual Sustainability, Energy and Water Conservation Report. Fiscal Year (FY) 2015 has been a significant and rewarding year for the Architect of the Capitol's sustainability efforts. Thanks to the dedicated work of teams across the agency, we successfully met the 2007 Energy Independence and Security Act mandate to reduce energy consumption by 30 percent from our FY 2003 baseline. Ten years ago, we began working to meet this aggressive goal and have accomplished it by implementing a comprehensive energy management program. This annual report presents the agency's notable achievements in energy and sustainability for FY 2015. We have continued to focus on energy efficiency, sustainable practices and cost reduction. As a result, we identified more than $80 million in cost avoidance, executed $90 million in facility upgrades, saved 600 Billion British Thermal Units (BBTUs) and reduced our emissions by 25 percent between 2006 and 2015. Our decade-long effort led to best practices that will set us on the road to meet new energy and sustainability commitments and preserve the character of our nation's buildings. The years were marked by an ever-evolving set of challenges and opportunities; however, it is with great enthusiasm that I say we are not done yet. The AOC's investments in energy conservation are not for the short-term. These investments in the future of our nation's treasures drive productivity, improve efficiency and support the environment for our neighbors and community. We are setting new goals for energy, greenhouse gases, water, renewables, clean energy and ongoing high-performance buildings. As part of our long-term Strategic Vision, the AOC is committed to strengthening a culture of sustainability aligned with fiscal responsibility. In the years ahead, we will continue our contributions toward meeting new goals and major projects such as cogeneration; and preparations will be made for future investments in energy savings in the Library Buildings and Grounds jurisdiction. Finally, I would like to thank congressional members and the public for their support of the AOC's unique mission to continue its legacy of sustainability. Thank you for helping the agency be successful in meeting its goals.